What’s Next for Indonesia-Vietnam Defense Ties? A closer look at where the relationship stands following their recent meeting. Last week, the defense ministers from Indonesia and Vietnam led their respective delegations for another round of their bilateral defense meeting held in Jakarta. The meeting saw both sides discuss broader regional and global security issues as well as take stock of their bilateral defense cooperation, including outlining future steps for cooperation through the signing of a new joint vision statement out to 2022. As Indonesia-Vietnam relations have developed over the years, from a comprehensive partnership agreement signed in 2003 to a strategic partnership in 2013, the two countries have also looked to make progress in the security domain as well. Recent defense dialogues have focused on further steps to implement their memorandum of understanding inked in 2010, efforts to develop defense ties more generally including joint exercises, dialogues, and military equipment, and means to better manage challenges, including the treatment of fishermen amid some recent clashes at sea. Last year was an active year for defense ties, with Indonesian Defense Minister Ryamizard Ryacudu making his first Vietnam visit since assuming his position and then-General Secretary of the Vietnamese Communist Party Nguyen Phu Trong making a trip to Indonesia – the first by a Party chief since the late Ho Chi Minh in 1959 and the first by a top Vietnamese leader since the inking of the 2013 strategic partnership. Though the focus of his visit, which included a meeting with Indonesian President Joko “Jokowi” Widodo, was on the relationship more generally, there were some defense-related developments including the signing of a letter of intent on cooperation between their two coast guards. This time around, Vietnam Defense Minister Gen. Ngo Xuan Lich was in Jakarta to meet with several top Indonesian officials, including Ryacudu for their defense meeting on October 13. During the meeting, both sides discussed the broader regional and global challenges they both confront, including terrorism, cybercrimes, human and drug trafficking, illegal fishing, and the South China Sea issue. Ryacudu in particular emphasized the fact that none of these challenges could be confronted alone and required partnership among regional states. The two sides also discussed thornier issues, most notably managing their maritime boundaries amid some recent clashes at sea as both concluding negotiations on the delimitation of their exclusive economic zones. This has been an ongoing issue that has factored into their recent engagements even though it often is not as widely publicized in official accounts by the two sides as much as other areas of convergence. They also reviewed the existing infrastructure of the bilateral defense relationship, agreeing to continue the joint working group for their armed forces and the implementation of a defense policy dialogue into 2018. They noted areas for future progress such as education and training and defense industrial cooperation. Both sides also inked a joint vision statement to guide the overall defense relationship out to 2022. 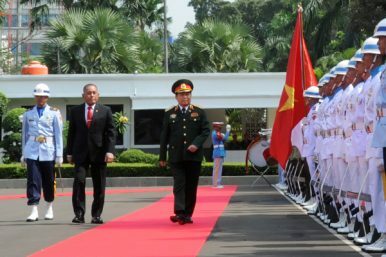 That was both a notable step in the institutionalization of the defense relationship and yet another indicator of the emphasis they are placing on security ties as being a pillar of the broader Indonesia-Vietnam strategic partnership. Both sides continue to look for ways to enhance opportunities and address challenges in the maritime realm of their bilateral ties.